Head to Sips & Bites, a khau-galli situated in Balewadi with an Indo-western twist. 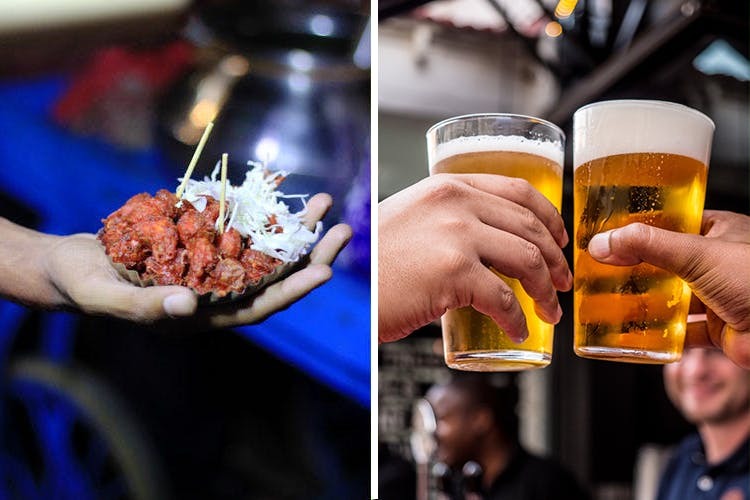 Right from humble poli-bhaji at INR 70 to Chinese dishes, fried snacks to chicken rolls, the place has several food stalls catering to different taste-buds. You can also find amazing thick shakes for as low as INR 35 which come with complimentary chocolate shots. How does the thought of fluffy bhaturas with authentic spicy chole make you feel? Hungry already? Wait for the twist! What if the chole bhatura platter comes at just INR 80? Control the excitement and head to Teri Rajput on North Main Road to satiate your hunger. We recommend you try their parathas and puri bhaji which come for just INR 60. Tip: Don't stop there, explore the street food at the beginning of lane no 6 which serves amazing Thukpa, momos, sandwiches for under INR 100. Though crammed and congested, Pune city peths are known for affordable shopping and good street food. We suggest you explore authentic Maharashtrian joints like Pune Guest House, Khadadi and Chitale Bandhu for delicious food starting at INR 100. Be it chaat, dosa, matki bhel, taak, misal or even the humble pithla-bhakri, you will find vendors in every nook and corner of Tulsibaug road, Laxmi road and Sadashiv Peth to satiate the hungry foodie in you. Situated in Aundh, this place is a go-to place when in a mood to enjoy drinks at dirt-cheap rates. IMFLs, Cosmopolitans, Sangrias & Mojitos at just INR 99, Hoppipola is a paradise during its happy hours for every booze lover. We recommend you ask for the offer of the day before you visit to get some amazing deals. Pssssst, we won't tell you that they serve the sinful Kamakazi shots at INR 99 as well! Hurry up! We love the happy hours' menu at this eatery. Hidden Place is not so hidden because of its amazing offers on beers and cocktails. We recommend you try their classic mimosa which is just for INR 199. A perfect place to unwind with friends and bae, the place perks up your evenings with live karaokes, lip-smacking food and crazy music.